Skriv inn din e-postadresse for Caroline Lost relaterte nyheter og oppdateringer. Caroline Lost is no stranger to writing songs for films. A talented singer/songwriter and multi-instrumentalist, Caroline has had more than 10 self-penned songs appear in feature films as diverse as "Narnia" to the chilling horror film "Severance". 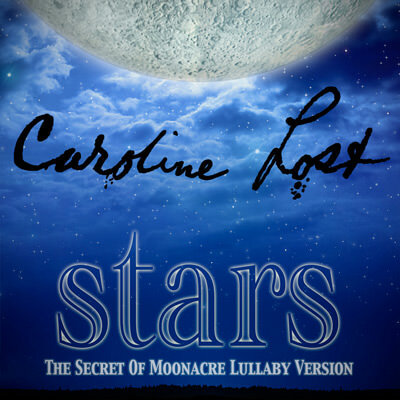 Caroline's first song to appear in a film was "To Be With You" - a moving ballad from the closing-title sequence from hit U.S. cult film Chasing Liberty - which is paired here with her most recent track "Stars (Lullaby Version)" from the highly acclaimed children's epic The Secret Of Moonacre released February 2009. "I wrote 'Stars' with Christian Henson, the Ivor-Novello nominated composer who scored 'The Secret Of Moonacre'," says Caroline. "Skye Edwards from Morcheeba sings 'Stars' in the film, but this Lullaby Version is my own take on the song. We recorded the track using the distinctive felted piano featured throughout the film and we also enlisted the help of The Sacconi Quartet, who performed on the film score. What we have created is a soft, haunting version that is powerful in its intimacy and sparseness." For the past three years, Caroline has focused on her songwriting career, penning songs with German artist Sasha that went on his latest Top 10 album "Open Water" (Warner Music 2006), "Go Go", a Top 5 single for Hanna Pakerinen (winner of Pop Idol 2004 Finland) that went on her latest Top 5 album "Lovers" (Sony BMG 2007) and "Breaking Free", a promotional single for UK Pop Idol winner Michelle Mcmannus that came out alongside the release of her first book in 2006. However, none of these songs reflect the sound of Caroline Lost. In-between writing for other artists, Caroline has made the decision to step into the spotlight as an artist and has recorded her own album, "One More Nail". Produced with long-time collaborator Christian Henson, the album is a seductive orchestral-pop masterpiece that showcases Caroline's fragile vocals against her gritty lyrical content.